Three years removed from releasing North Americana, singer-songwriter Leif Vollebekk promised today on Twitter that a new record "ain't far off now." The first taste of what Vollebekk has been up to lately comes with "Twin Solitude," accompanied by a video. 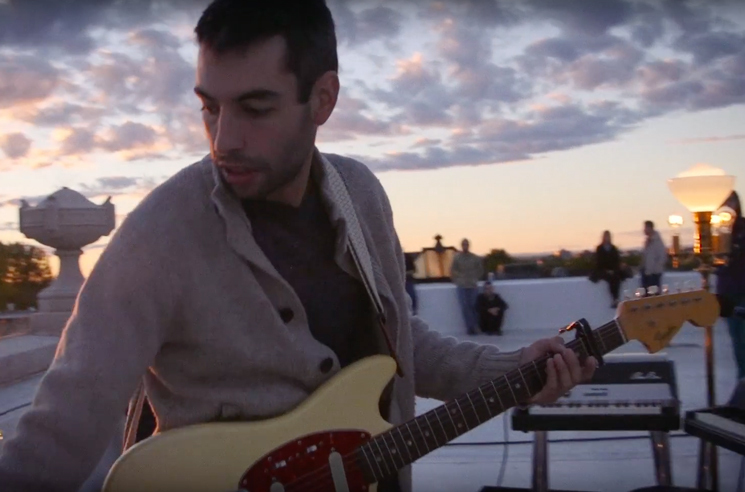 Shot and produced by Kaveh Nabatian with additional shooting from Jon Durand, the video finds Vollebekk on the rooftop of Montreal's Rialto Theatre at sunset, playing to a small crowd for the city's Pop Montreal festival. Performance footage and candid shots of the crowd have been slowed down to fit the equally dreamy new tune, marked by gently picked guitar. North Americana arrived in 2013, along with free EP Borrowed Time, which saw Vollebekk cover tunes by the Killers, Neil Young, Sigur Rós, the Beach Boys and Bob Dylan. While we await further details on his forthcoming effort, watch the video for "Twin Solitude" in the player below. UPDATE (11/02, 12:15 p.m. EDT): Vollebekk's new album Twin Solitude will arrive on February 24 via Secret City Records. You can now hear the new track "Elegy" at the bottom of the page.